PSNews - The Ministry of Public Security (MPS) on April 8 held a ceremony to announce a decision of the Minister of Public Security to appoint Major General To Van Hue as the new Director of the Department of Police Records Management. Senior Lieutenant General Nguyen Van Thanh, Member of the Party Central Committee, Deputy Minister of Public Security chaired the decision announcing ceremony. Senior Colonel Le Minh Thao, Deputy Director of the Personnel Department announced the decision. Senior Lieutenant General Nguyen Van Thanh hands the decision signed by the Minister of Public Security on the appointment to the new Director of Department of Police Records Management, Major General To Van Hue. At the event, on behalf of the Standing Committee of the Public Security Central Party Committee and leaders of the MPS, Senior Lieutenant General Nguyen Van Thanh handed the decision signed by the Minister of Public Security on the appointment to the new Director of Department of Police Records Management, Major General To Van Hue, and congratulated the Department of Police Records Management and Major General To Van Hue on his promotion. Deputy Minister Nguyen Van Thanh asked the Party Committee and leaders of the Department of Police Records Management to support Major General To Van Hue to fulfill his tasks in the new position, urged the whole unit to promote unity and give advice to the leadership of the MPS on the management of professional records of the Public Security Forces. Deputy Minister Nguyen Van Thanh also asked Major General To Van Hue to continue to improve his political stance, morals and lifestyle as well as to heighten his sense of responsibility and improve his professional expertise to successfully fulfill all assigned tasks. 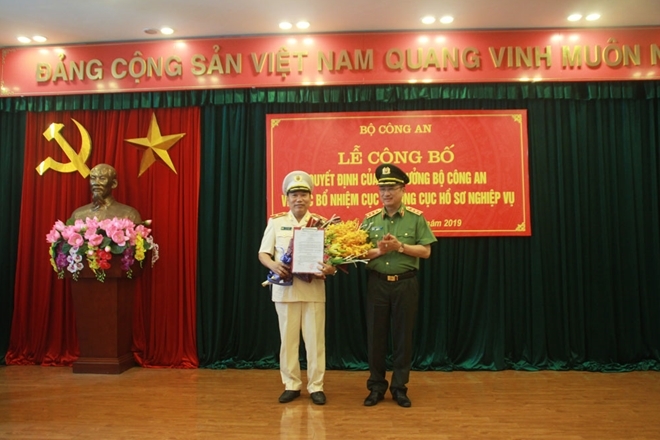 In his swear-in ceremony, Major General To Van Hue affirmed that he will work closely with the Party Committee and leaders of the Department of Police Records Management to consolidate the unit’s unity and successfully fulfill all assigned tasks, and serve as a reliable foundation for all forces within and outside the MPS.